Carl Barks & The Art of Being a "Good Duck Man"
Carl Barks is known as Disney's “Good Duck Man” — emphasis not entirely mine. 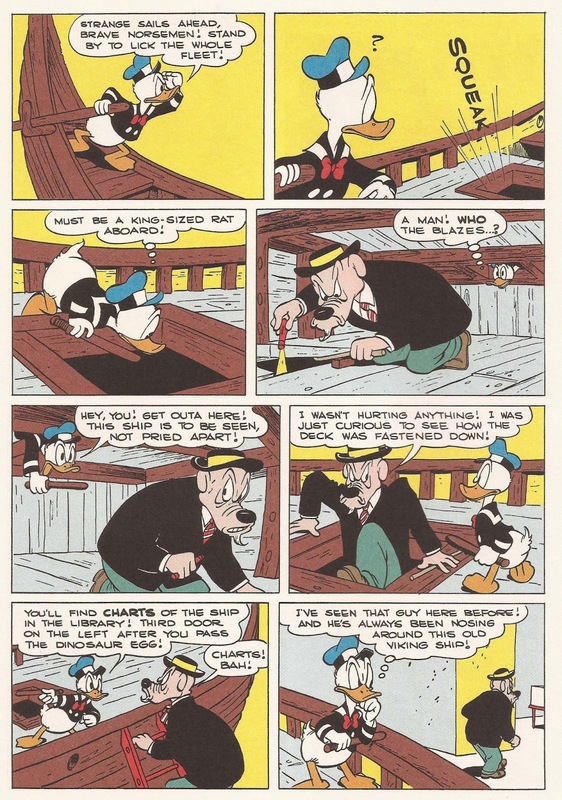 When Barks worked in Disney's comic book stable during the '40s and '50s, it was standard practice for Disney to publish without giving credit to either writer or artist. Other artists penned Disney duck adventures, but Barks's stood out as exemplary — hence the moniker. 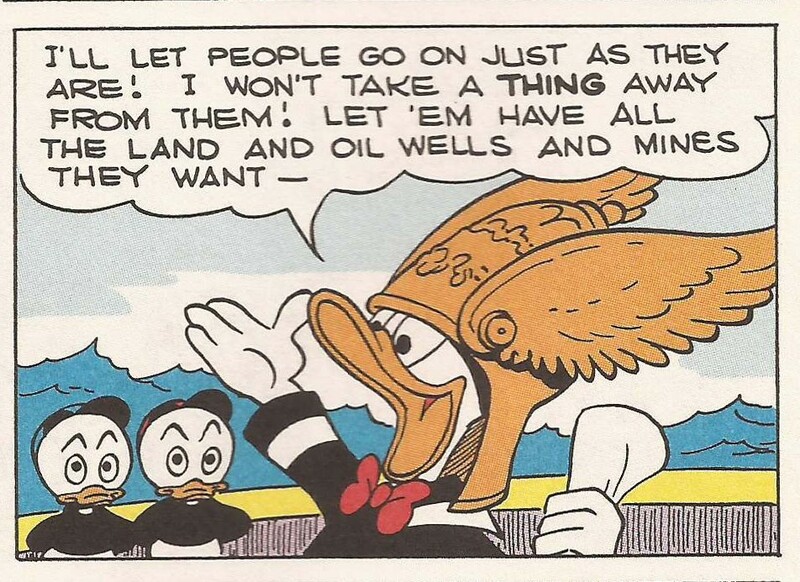 Panel 1 sets up the crux of Donald's predicament: he's underemployed as a museum security guard, resorting to flights of fancy to stave off tedium. His reverie is interrupted by an interloper who nudges Donald into active duty — the first time Donald is required to actually guard something. 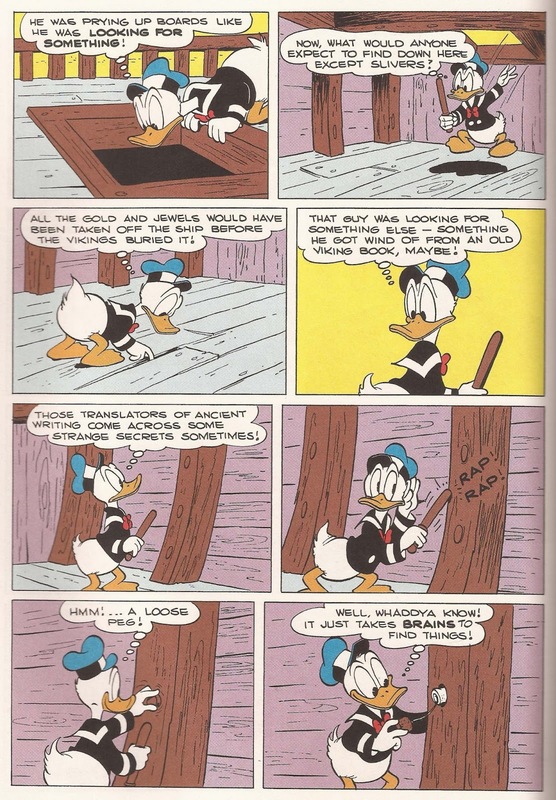 When we reach the concluding panel, the peculiarity of the scene causes Donald (and the reader) to wonder what this is all about. Here Barks combines the art of silently advancing the story via Donald's snooping and tapping — a Visual Narrative technique common to the animation studio Barks left behind — and colours it in with Donald's internal monologue of reason/speculation. Needless to say, the discovery leads to the compressed “Tom Swift” sort of adventure Barks was famous for. As for characterization, much is said about the complex moral nature of Barks' ducks — sci-fi provocateur Rudy Rucker goes so far as to label them “anti-heroes.” This is surely overstatement made for effect, but Barks was nevertheless keen to exploit his heroes' moral vulnerabilities. 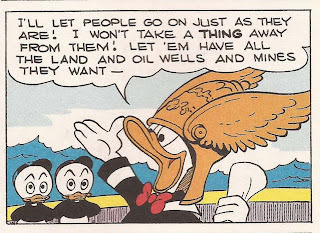 In this adventure, Donald will briefly succumb to the allure of the MacGuffin, a Golden Helmet which confers ownership of all of North America to its bearer. That said, what I find charming about Barks' heroes is their facial innocence. Contrast Donald's snooping with that of the Dickensian villain he interrupted. Donald begins in state of mild pique, wondering what this grotesque, suspicious-looking malcontent was looking for. The more he ponders the puzzle, the more benign his facial expressions become, until — oh joy! — he discovers what the villain missed. It is this innocence that draws the reader in and allows him to take pleasure in the hero's later (and tirelessly repeated) renunciation of the same. Some years back Disney mounted an animated series based loosely on Barks' adventures. The one episode I watched was surprisingly faithful to the source, but I was left completely cold. Voice was a huge impediment to my enjoyment. Scrooge sounded like Mike Myers impersonating his Scottish grandmother, the boys sounded like mice being squeezed through a penny-whistle, and Donald sounded like the lame duck he's morphed into since he stopped spanking the kids and started attending anger management workshops. Viewers unfamiliar with the comic books were able to take the series at face value and judge it (approvingly, for the most part) for what it was, while those of us who'd worn the books thin were dissatisfied. The true artistry of comic sequential art is, as Scott McCloud so brilliantly elucidates, invisible — it is what the reader brings to the work, under the artist's subtle prompting. At his best, Barks' colluded with the reader on a level of silently shared intelligence that, today, seems almost formidable. The geeks at Boing Boing are admirers of Barks, and occasionally puzzle over the near-extinction of the Funny Animal Genre. I believe the unusual longevity of Barks's duck stories shines a telling light on this species' endangered status. But that's material for another post. 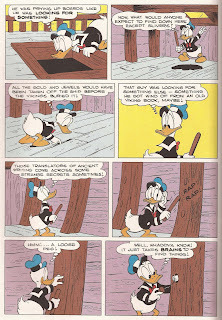 The panels here are all from "The Golden Helmet"
volume, Donald Duck: "A Christmas For Shacktown"
Wup: missed my own anniversary, yesterday — with Google Blogspot. Nine years, and counting. 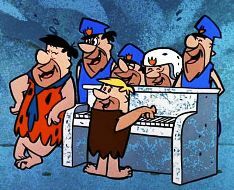 Somebody please cue Bedrock's finest. Funny: I recall being nervous when Google acquired Blogspot shortly after I started posting. I can't recall the specific reasons why, though I think the move insinuated the potentially transient nature of hosting. If Google decided bloggers weren't generating income, we might all be done for, our “intellectual content” (such as it is) vapourized like so much skywriting. I still try to maintain the attitude that this content is transient. But man oh man: nine years, without crashes or, really, any significant blips. For a couple of years I ran another blog off my own web address, with the generous tech help of another friend. The back-end assaults were endless, and grew exponentially by the week. Type that address into your browser and you'll get yet another 404 screen. Not so the bright orange banner with white lettering. So far as I'm concerned, Google deserves an award for nine years of incomparable service — all this at no fiduciary expense to yours truly. Oh, wait: that's my side of the bed. My ideal bookshelf would look exactly like that. Plotto, Truth Is Naked, Pogo, Uncle Scrooge: His Life & Times, MAD About The 60s, Hubble, Mastery, my 33 1/3 library, the Bible, A Canticle For Leibowitz, On Lying In Bed & Other Essays, The Night Offices, A Wild Peculiar Joy, God: A Biography, Clean Cartoonists' Dirty Drawings, Behold This Dreamer, Mickey Mouse: Race To Death Valley, The Road Home, Moon Palace, The Book of Disquiet, The Sun Also Rises, A Wrinkle In Time, Swann, The Blood Of The Lamb, Gilead, For The Time Being, Little Big Man, Hour Of The Dragon, King Lear, Hamlet, Anathem, The Cross of Gold Affair.